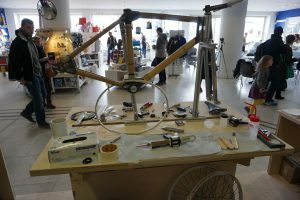 In April this year Oxford Brookes University collaborated with the Bamboo Bicycle Club to successfully build the world’s first ever bamboo and 3D printed lugs bicycle at London’s Design Museum. The live event was to coincide with the Cycling Revolution exhibition at the museum where the Bamboo Bicycle Club displayed another first in the form of the world’s first aerodynamic bamboo bicycle. The Bamboo Bicycle Club based in London, provide higher education establishments with educational bamboo learning packs and help people who are passionate about cycling to build and ride their own self-build bicycles in their East London workshop. The club was founded by James Marr, a bike riding engineer who decided to create a bicycling community with others who are interested in building their own beautiful, robust and environmentally friendlier bamboo bicycle frames. It continues to grow and innovate, creating a friendly community of bike builders, creative thinkers and cyclists. Engineering staff and students from Oxford Brookes researched and tested different composites, and took two weeks to complete the 3D printing for the nylon reinforced carbon fibre (used on Formula 1 cars) lugs, which are used to join the bamboo frame together with special urethane adhesive glue. This process is expected to become a lot faster in the future and could have a huge impact on British manufacturing. The frame and completed bike with all the full components was built live at London’s Design Museum and ridden during the event. The live event was featured on the Global Cycling Network show (2:08 mins onwards). The impact manufacturing has upon the environment means there is an increasing responsibility on various companies to provide products from sustainable resources. This project aimed to design, develop and manufacture bicycle frames made from ‘carbon neutral’ renewable resources, such as bamboo and flax, which potentially offer a more sustainable engineered alternative to that of traditional bikes. Bamboo is a fast growing grass requiring significantly less land and water to grow than other trees, and can absorb up to five times more CO2 and release up to 35% more oxygen than an equivalent stand of trees. It can be harvested after four or five years and re-grows easily. In 2011 Dr Gerguri and Dr Broughton put the innovative bikes to the test successfully completing the 400 mile TransAlps race, a gruelling eight day test across mountainous alpine terrain. The bamboo frame, which has passed stringent European testing standards, gives a design that is robust, durable and helps to reduce vibrations when travelling across uneven ground. The bikes went on, under licence, to be manufactured by RAW Bamboo Bikes Ltd. 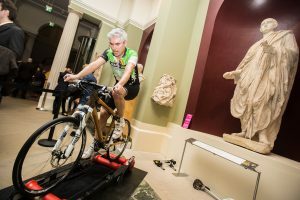 In 2015 Oxford Brookes staff rode 150 miles on the bamboo bikes at a ‘Wisdom, Wonders and Widgets’ event hosted jointly by Oxford Brookes and the Ashmolean Museum as part of the University’s 150th anniversary celebrations. You can watch a video of the bikes being ridden here. Dr Shpend Gerguri is a Senior Lecturer in Engineering Design at Oxford Brookes University. Over the years he has been responsible for Engineering Design themes in the fields of automotive, motorsport and mechanical engineering, at undergraduate and postgraduate levels in MEMS. Dr James Broughton is Head of the Joining Technology Research Centre at Oxford Brookes which focuses on the understanding of the science of materials, joining practice and the ability to respond to commercial reality, leading the Centre to provide support to over 100 organisations throughout the UK and abroad.